Exoticism, comfort and luxurious villas in Thailand: the ingredients for a successful stay! 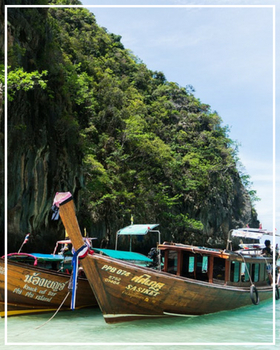 Between the capital Bangkok, real anthill, the southern paradise islands and the northern tropical forests, Thailand reveals its richness through its landscapes. Lulled by its traditions, the “country of smiles”, with its nickname and welcoming population, will successfully seduce you! Check our catalogue of rentals for the holidays in Thailand, on Phuket island: pure exoticism! Near the beach, all our luxurious villas in Thailand have a swimming pool and offer a beautiful view of the Andaman sea. For even more comfort, some services are available in addition to your reservation, such as car rental, spa access or baby sitting services. Thinking of Thailand, one thinks instinctively of the sublime temples of Bangkok like the Grand Palace and its gleaming gilding, symbol of the power of royalty in Thailand or the incredible historical city of Ayutthaya, with its Buddhist statues that now become one with the trees. But these are not the only cultural beauties that are found in Thailand! You can also visit the famous prehistoric site, one of the most important in Southeast Asia, Ban Chiang in Udon Thani. Among all the wonders that are unique to Thailand, the one that will mark you the most is certainly the Thai gastronomy. Many say it is the mother of all kitchens and especially that of Asia. It is impossible to stay in Thailand without tasting an excellent Thai Pad, real national dish. Amateurs of seafood will be delighted because many dishes are cooked from fresh fish and exquisite seafood, always adorned with spices and aromatic plants to make the dishes unique and you can take your taste buds on an unforgettable tasting journey. In addition to being a very rich country culturally speaking, Thailand enjoys an incredible lush nature. With its many national parks like the sublime waterfalls of Erawan or the park of Khao Sok. Some of our prestigious homes have a panoramic view of the Phuket Sea or Koh Samui, a true postcard landscape. Whether it is a modern design house or a traditional style villa, you will always find yourself in an exceptional setting for an unforgettable holiday.